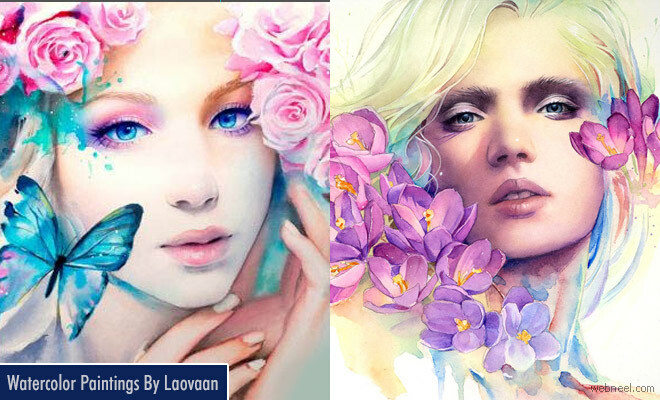 Watercolor Paintings : Laovaan is a freelance watercolor artist based in Germany. He loves to mix traditional manga characters into vibrant backgrounds which look almost surreal. He loves to experiment with colors and he uses mixed media to make his paintings beautiful. He draws inspiration from movie characters, manga characters and game design characters. His paintings are mostly of women characters portrayed which special powers. Some of his paintings look so dainty with butterflies and flowers to show the emotion of the woman. Looking at those attributes, you can identify the state of the character. He enjoys using digital media to create his paintings, but currently he is focusing on watercolor paintings so he can teach people all over the world to paint. You just need to have a passion for painting, rest is history.